By Willem Robert van Hage. Acknowledgments to Jesper Hoeksema and Marieke van Erp. This tutorial shows how to do a visual analysis and basic statistical analysis of the data in the Linked Open Piracy data set. It makes use of the SPARQL Package for R and the ggmap package. For another tutorial of how to use the SPARQL Package, in combination with the sp package for spatial processing, check out the deforestation tutorial. The SPARQL Package allows you to directly import results of SPARQL SELECT queries into the statistical environment of R as a data frame. That means you can directly perform statistical analysis on data sets on the web. For example, you can use the following R code to get data from the Linked Open Piracy SPARQL end point described below. The complete script is available for download: lop_tutorial.R.zip. State that there are no further options to send to the SPARQL server. These options are sent as HTTP parameters and differ per end point. For example, Jena Fuseki can take the option “output=xml” to dictate that it should return XML, SWI-Prolog Cliopatria can take “&entailment=rdfs” or “&entailment=none” to state which kind of reasoning to apply. 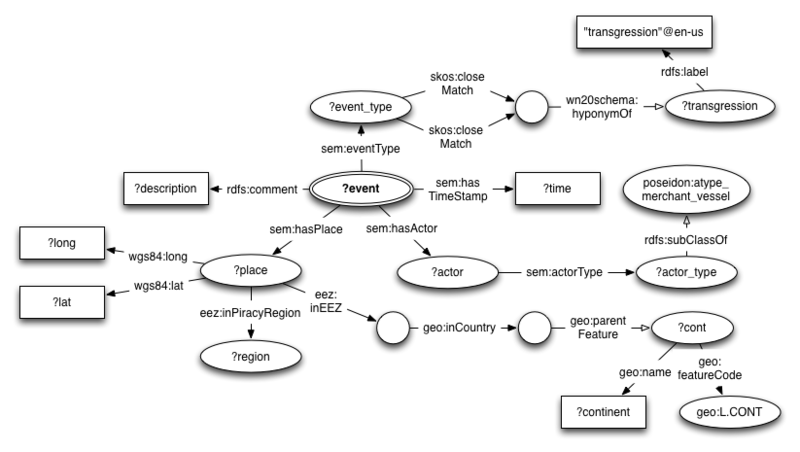 The data you will now be able to access follows the Simple Event Model schema. An example of the structure of the graphs in the triple store is shown below. The queries will match parts of this graph. 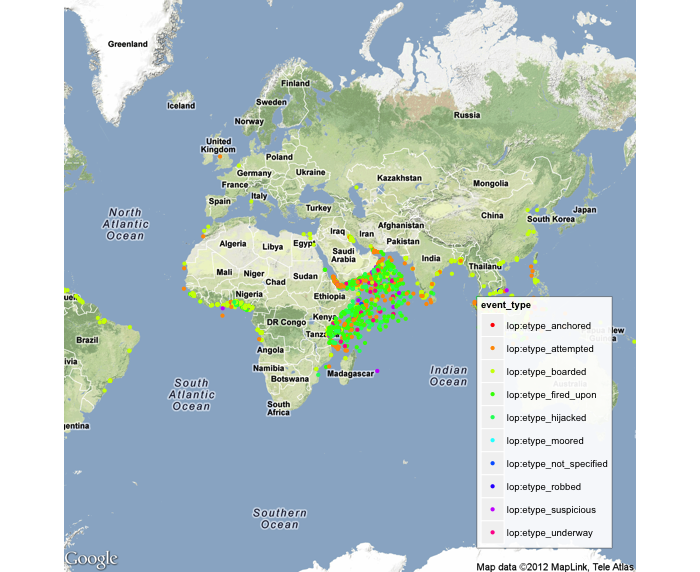 Let’s write a query that gets all piracy events and the geographical region where these events took place. The events are described in the Simple Event Model, where events are linked to the places where they happen. 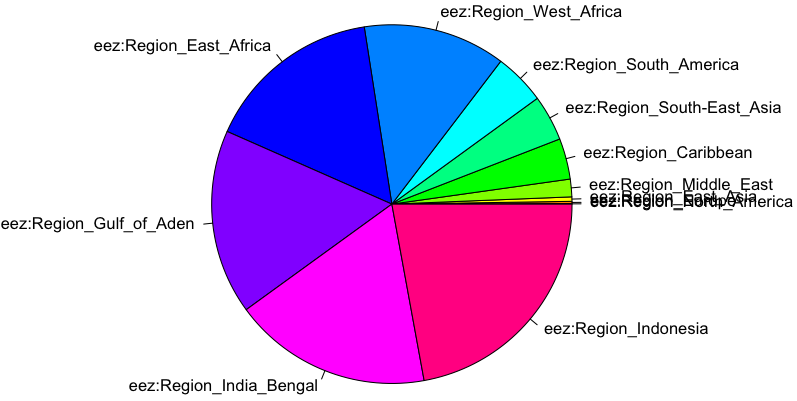 In the case of the Linked Open Piracy data set, these places are categorized in regions with the eez:inPiracyRegion property. To gather all the events and their associated regions, you can use the following query and fire it by calling the SPARQL function. Every variable in the SPARQL query will correspond to a column in a result table data frame. Now, if we want to see where these typed events actually happen in the world, we similarly extend the query to fetch the latitude and longitude of each event and use the ggmap package to plot them on the map with the same colors as before. 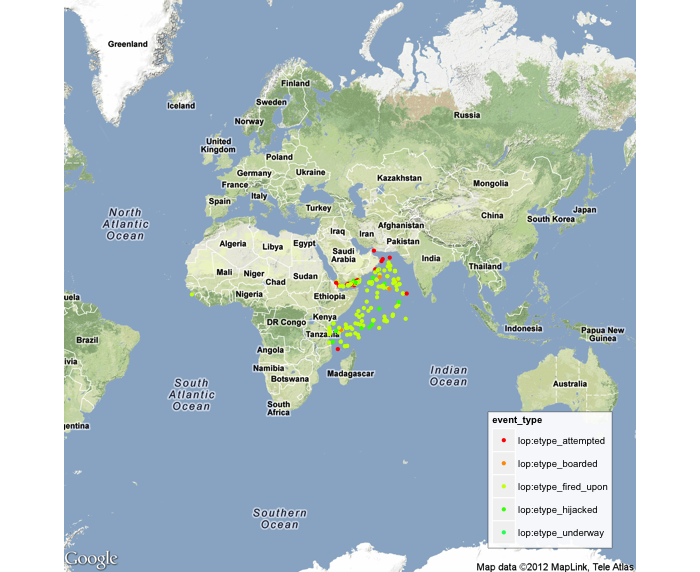 We use the gmap function to fetch a Google map centered on the Gulf of Aden at zoom level 2. We tell the ggmap package to use the event_type column in the result data frame to determine the color and to the the lat and long columns to set the x and y coordinate on the map. with the geom_point function. The colors are set with the scale_color_manual function. This makes it immediately clear that RPGs are involved mostly in (attempted) hijackings near Somalia. Most of the piracy occurs in Indonesia, but is clearly of an entirely different sort. 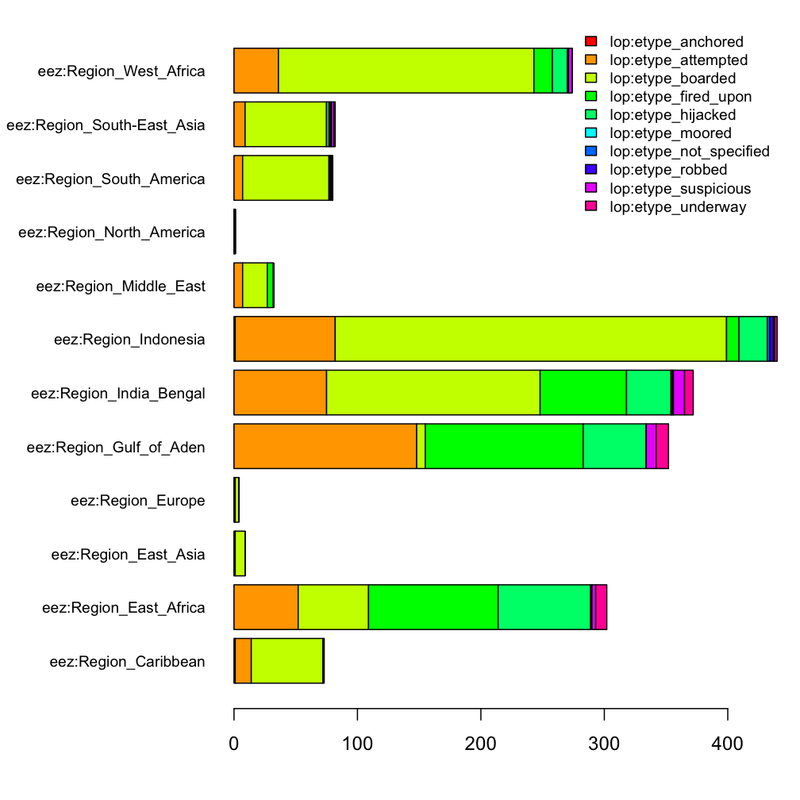 Now we will correlate regions with respect to which event types occur in these regions and show the Pearson correlation of all the regions with the region Gulf of Aden, sorted in decreasing order. You can see that there is only one strongly correlated region, which is East Africa (out of the coast of Somalia). The rest is weakly correlated. If we look at the correlation of the regions with respect to the types of ships that are attacked, we see a different picture. Regions are much more similar with respect to the victim ship types. A region that stands out is Indonesia. Quite similar kinds of ships are attached as in the Gulf of Aden (big ships, although they are not underway but anchored, usually), but what happens to them is completely different (boarding and then theft, not hijacking). Let’s say we want to see what kind of attacks happen to merchant ships (e.g. bulk carriers, tankers). What we can do to accomplish this is use RDFS subClassOf reasoning over the actor type to check whether the victim ship type is a kind of merchant vessel. If we compare this to the number of events of other vessel types, we can do a chi-square test to see if this distribution is significantly different to the attacks on merchant vessels. Now we deduct the number of events on merchant vessels from the number of events on all vessels to get the number of attacks on non-merchant vessels. Now we can do a chi-square test to test the equivalence of mv_et_table and rest_et_table. You can see that the probability of the difference between the two distributions is due to chance is 0.2336. At a confidence level of 0.05 this means we should conclude they are equal. In this tutorial we showed how to do simple visualizations of data in the Linked Open Piracy data set using the SPARQL Package for R. We also showed how to compute the Pearson correlation between two multinomial distributions (between two sets of counts of URIs) and how to do a statistical test, the chi-square test to determine whether or not the difference between two such distributions can be attributed to chance or not.